Straight from the glory of Comics' Greatest World, Frank "Titan" Wells, Amazing Grace and the Agents of Change are back, baby! But you've never seen them like this! 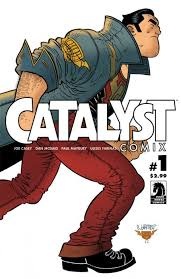 Superhero comics get a back-alley facelift as these very different champions confront cosmic threats and personal demons-and it all starts at the end of the world as we know it!